Executives at Transitions Optical received so much positive feedback from their Live the Good Light campaign that they've decided to continue to "spread the light" through the rest of this year. In the UK, Transitions Optical will team up with Channel 4 to tell the public about the benefits of switching to photochromic lenses. The main reason Transitions Optical started this ad campaign was to encourage millennials who wear normal eyeglasses to give the Transitions lenses a try. Transitions wants younger people to know that photochromic lenses don't only protect against the UV rays, they also help reduce blue light exposure from computer screens. A photochromic lens is a special kind of eyeglass lens that's clear inside but turns into a UV-protecting sunglass outside. Because Transitions Optical is so well known for its lenses, sometimes people just refer to photochromic lenses as "transitions lenses." 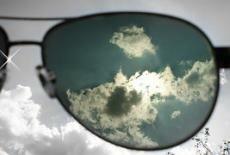 Photochromic lenses are usually made of glass, but they could be made with plastic or polycarbonate products as well. In addition to daily broadcasts on Channel Four, Transitions Optical will create an online resource to help younger people learn more about the company's products. Laurent Dosseville, Transitions Optical's head of marketing in Europe, told journalists that this Live the Good Light is all about connecting the younger demographic of eyeglass wearers. The key points Dosseville wants younger people to take away from this ad campaign are that Transitions offer "seamless comfort and protection…against UV and harmful blue light indoors and outdoors." To help potential customers decide whether or not Transitions are right for them, Transitions Optical just released its 360° Virtual Viewer feature online. Non-Transitions wearers can get a sense of what they'll see with these glasses on by opening up this application online or on their mobile phone. You can literally turn around in a circle and see how three of Transitions' top products look outside. As of today, Transitions Optical offers three main lenses: Signature, Vantage, and XTRActive. Signature lenses only turn dark outside and are totally clear indoors. Vantage lenses are polarized, turn dark outside, and tint slightly indoors. Finally, XTRActive lenses were designed for people who are extremely sensitive to light and will tint indoors, outdoors, and inside a car. Although Transitions lenses are more expensive than average eyeglasses, most eye doctors believe they are well worth the investment. Since photochromic lenses protect against UV exposure, people who wear these lenses have a lower chance of developing cataracts over the course of their lives. Originally founded in 1990 as a partnership between Essilor and PPG Industries, Transitions Optical is now exclusively a subsidiary of the French-based Essilor. In addition to Europe, Transitions Optical now does business in Asia, Oceania, North America, and South America.